− four = 3 Required Please enter the correct value. Alibaba earnings for fiscal Q2 2016 were released before the bell this morning (Tuesday). The company reported earnings per share (EPS) of $0.57 and revenue of $3.5 billion. That revenue total was up 32% year over year. Consensus estimates called for EPS of $0.54 on $3.35 billion in revenue. 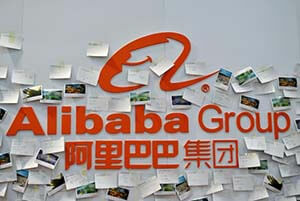 The Alibaba stock price soared more than 11% in pre-market hours following the news. But the biggest thing for investors is mobile gross merchandise volume, which comprised 62% of Alibaba’s total transactions. In last quarter's Alibaba earnings, the company reported mobile transactions accounted for 55% of Alibaba's total transactions. That was up from 51% the previous quarter and 33% the previous year. Investors will be looking for further growth this quarter. Alibaba has continued to invest heavily in mobile growth, so sustained growth is important. Alibaba stock has been volatile following earnings in the past, and this quarter is no different. Last quarter, Alibaba stock dropped as much as 8.2% after it reported revenue missed by just $130 million. It was a classic overreaction to Alibaba earnings. While revenue missed estimates, it still grew 28% year over year. Alibaba also beat EPS in the quarter and grew profits by 148%. This quarter’s huge beat is obviously better news for Alibaba stock than we’ve seen in previous quarters. And investors shouldn’t expect the rise in Alibaba stock to end here.